Veteran rockers Red Hot Chili Peppers will release I'm With You, the follow-up to the bloated 2006 double album Stadium Arcadium, August 30 once again joined by a new guitarist. Josh Kinghoffer replaces longtime guitarist John Frusciante, who has been in and out of the band over the years. Klinghoffer has toured with the Chili Peppers over the years but I'm With You marks his recording debut and he also lent a hand with the songwriting process for the 14-track new album. I'm sad to see Frusciante leave as he seemed crucial to the band's surprising career renaissance from funk-rock jokesters to the almost Beach Boys-esque, grown-up California rock band that produced Californication and By The Way. 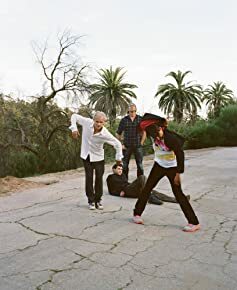 Since 2006, the Chili Peppers have kept a low profile although drummer participated in the supergroup Chickenfoot with ex-Van Halen'ers Sammy Hagar and Michael Anthony and guitar virtuoso Joe Satriani.